How do we talk about faith with Atheists? What if a modern miracle seemed to refute Christian claims? What about Mormon or Muslim claims of similar experience? How can non Christians be acceptable to God? What do I see Jesus’ mission to be? What did Jesus see as his mission? 1. That the same messiah would be the military leader, king, vicarious propitiatory death, the child born of the virgin, mighty God, counsellor, etc. 3. That this figure was rescuing the nation from its sin, first and foremost, and that any political emancipation was secondary, or subjective. 4. That “the kingdom of God” was not defined in geo-political terms, but in spiritual terms. 5. That this figure was a man, (“son of man”, ref: Daniel) and simultaneously “of God”. The nature of the Resurrection? Diversity of belief, or diversity of expression? I don’t claim to have the final word on the topic, but it’s about time for an initial word! For several hundred years, Christianity has too often approached the Atheist with pointed finger, and accusations and threats. All in “love”, of course! Because we don’t want the poor sod to burn in hell, do we? At what point do we reassess our approach…? At the outset, I have to say that if the “approach” is designed to convince the Atheist to become a Christian then frankly, don’t bother. They don’t care that you want them to become a Christian, and they’ve already heard all the tricks you have up your sleeve. But people have questions. 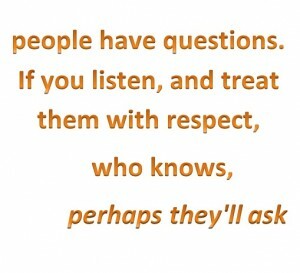 If you listen, and treat them with respect, who knows, perhaps they’ll ask! STOP PRESS: I have now posted a second, much longer example of a similar conversation. You can find it here. I very recently had a(nother) very pleasant exchange of ideas with an Atheist, who asked very reasonable questions. As is often the case, this person has a history within the faith, but has become convinced that Christianity simply isn’t true. I have these conversations quite frequently, and it occurs to me that publishing one would be fruitful. This is, after all, what “the mission field” looks like in the modern Western world. 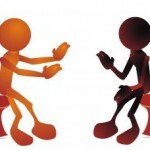 My experience is that, when people gain an inkling that I am willing respectfully to exchange ideas, they begin by challenging some traditional stronghold of the faith, press some common “hot-spot” triggers for argument, and then, having discovered that I am able and willing to converse through each of those matters, start to ask their actual questions about the faith. 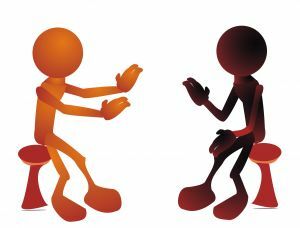 Most of my conversations, although they would be very helpful to blog and commentate like this, are not available because they are personal, private conversations. I have such conversations with a Muslim Imam (sat next to him on a plane), a young Muslim man (met him at a shopping centre), a very well educated Jewess (close family of a personal friend), a wonderful pious Sikh (met through work), as well as many intelligent, intellectual, well informed ex-churchgoing Atheists. I’m very grateful that the person whom I quote below (who’s identity is not relevant) has cheerfully given permission for me to reproduce the conversation in this manner. This allows me to post “a conversation with an Atheist”. The text on the left is my part of the conversation, and the “quoted text” is that of my friend. I have changed his name to “Darren”, because it isn’t important who the person is. It isn’t a secret, but this conversation is so similar to many others that I have had, that it can stand as an archetype. For that reason I want to take the focus off Darren as “that particular guy”. Let’s just see him as the “every man” of Atheism. To respond to the original question [which concerned miracles, and religious claims based on them. It explored what might happen if the entire Atheist Convention of 4000 participants suddenly became convinced Mormons, and asked whether that would have the effect of confirming Mormonism as “true”], my experience is that proclaiming the worldview that Jesus claimed (and which the apostles taught), among earnest seekers of spiritual truth, creates the effect that the Bible describes. Namely: The person has an experience (sometimes suddenly, more often gradually) of entering into a remarkable new state of being, characterised by joy, peace, and a subjectively self-evident relationship with God. There may be all kinds of naturalistic descriptions of this process, but having been on it myself, I dismiss them. This is a miracle. It is the one to which all the others pointed. I don’t agree that “signs and wonders” necessarily must be seen for people to become Christians. What they require is an introduction to the kingdom of God. For some, that’s a healing. For others, it’s a ‘piece-of-the-puzzle’ about God’s nature. For others again, it’s an answered prayer. The common denominator is that the person perceives, and enters into the Christian worldview (John 1:12). From that new perspective on life, the universe and everything, “miracles” of all kinds are not at all remarkable, but are anticipated uncritically. 4000 converts from Atheism to Mormonism would have no effect on me at all, nor on those whom I have taught. Romans 8:15.
thanks for posting kevin. [snipped] – i haven’t seen him in ages…. i wonder what you would make of the profoundly joyful and peaceful experiences of atheists like me who have realised that christianity (while sometimes coming with its joy, peace, and perceived relationship with the creator of the universe) simply isn’t true. and i wonder what you would make of the “subjectively self-evident relationship” that a mormon or muslim might speak of with respect to a being that you simply don’t believe exists. but you do raise an interesting and important point. most christians (and i am speaking anecdotally here) don’t become christians because of evidence for its truth. rather, it is based more on subjective experiences. almost all of us feel regret for not living up to the standards we have for ourselves, and the christian message speaks powerfully to those who want a new start. and it certainly produces good fruit in some of its adherents. but, as i alluded to above, so do plenty of other religions. this doesn’t mean that christianity is false a priori, but it certainly does prove that a religion doesn’t have to be true for its followers to be profoundly changed people, or even to have convincing experiences of the being they come to believe is the creator and judge of the universe. finally, i’m interested as to what you might specifically mean by “earnest seekers of spiritual truth”. 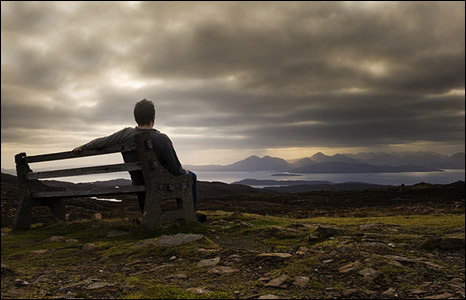 what would you make of the countless former christians whose earnest seeking after spiritual truth caused them to come to the realisation that the beliefs they had always had were simply not true? Hi Darren. Thanks for asking. A1: I have no problem with that. I experienced that myself when I was an atheist. A2: Mormons and Muslims would both insist that the “being” is precisely the same one, but that they have the more accurate definition of the being. This is the case for all Abrahamic religions. A3: I see tremendous value in many of the other religions (some I have more trouble with – like those which ritually seek and celebrate pain, torture, death, etc). I agree that none of the sometimes remarkable effects in personal transformation achieved by their adherents proves the veracity of any of their supernatural claims. A4: I deliberately employed a term with maximum inclusiveness. I agree that the category you describe falls inside the definition. In fact, when I have spent time with precisely such people in the manner I describe, many of them are deeply blessed by the experience. In some cases they even find that their atheism is a little more nominal than they had supposed, because they have found a safe place to discuss their doubts about it. The same goes for Christians who harbour doubts but find few safe places to discuss them. Many professed atheists are just intellectual people who couldn’t find anyone to answer their questions about the faith with intellectual integrity. Because they are offered only dogma in response to genuine enquiry, they are forced to conclude that there *is* no intellectually satisfactory answer, and that faith is counter-reason. The logic doesn’t quite hold, but its compelling when you’re the one going through it. Jesus didn’t condemn other (dis)belief systems. Those who professed to know the Father (the Jews), he admonished to do so (as did Peter at Pentecost). All others who sought the Father, he was happy to teach and guide (like the Samaritan woman at the well). Paul sought out those who wanted religious instruction, by going to the synagogues and the aereopagus, and gave freely to them. Confrontations with other groups, like the followers of Diana, were not instigated by him. It was they who confronted Paul, because their sales were down. It was Christians whom Paul instructed, admonished, and exhorted. This shapes my own engagement with other people on matters of faith. Frankly, I am found by so many people who want to know more about their God, or people who are genuinely curious about the faith and have intelligent questions (like yours), that I scarcely have time to think about chasing after those who don’t show any interest. I think that was Jesus’ experience, and Paul’s also. 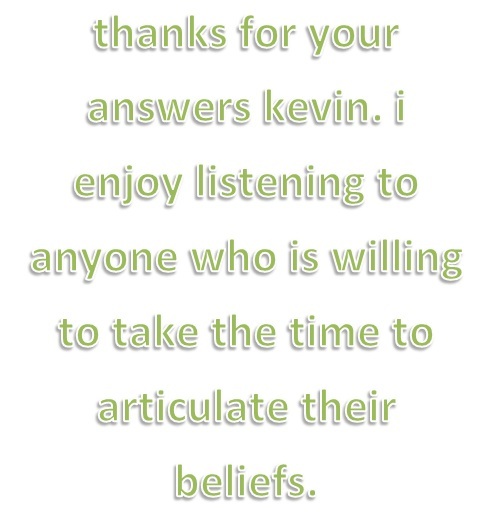 thanks for your answers kevin. 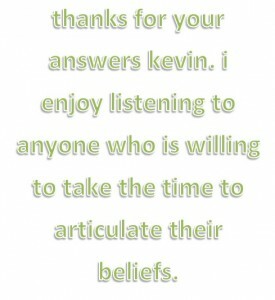 i enjoy listening to anyone who is willing to take the time to articulate their beliefs. in the spirit of not “starting arguments”, i’ll keep my response more in the spirit of seeking clarification on some points you’ve raised. regarding Q2, i did not intentionally refer to two religions that (profess to) share the same deity. i guess you could substitute another religion here, one that has a deity whose attributes proclude it from being the same as yahweh. i’m also interested in your views on non-christians, and how these people might be acceptable to god. i might be reading into your response something that is not there. but how do you think god (yahweh) would judge someone who had accepted their own tribal religions, perhaps a religion that involved practices that would be abhorent to yahweh? or even someone, like me, who disbelieves christianity even after hearing it clearly preached – who has in fact read the works of the christian scholars and apologists and, precisely because of reading such works and finding them lacking, came to reject christianity? i ask because i’m now more than ever interested in what different christians see as the truths about christianity (some of which i would have considered heretical when i was a more or less standard “sydney anglican”). My past atheism began in adolescence, when God, Santa Claus, and the Tooth Fairy all suffered an ignominious demise in my worldview, so I don’t think I was ever in the category you describe. I was happily satisfied with atheism until suddenly, God spoke to me. I apologise that this sounds jargonistic and dogmatic, but I simply have no other way of describing it. To say that this “messed with me” is an understatement. The Tooth Fairy might as well have leapt onto my computer keyboard singing, “Jingle Bells”, because I certainly didn’t invite it. On Q2, I think I covered it in my A3. I don’t consider my subjective experience to be proof for anyone else’s purposes, nor is their experience going to prove anything to me. On God’s view of non-Christians, I think it is important to note that when Jesus pointed out God’s providence and salvific care for non-Jews (Luke 4:25-27), the people rose up instantly and tried to kill him (vv28-30). It suffices for me that God will judge everyone “according to what they had done” (Rev 20:13), and it’s not up to me to question that. Evangelicals (admittedly with support from reasonably long-standing theological contemplation) have done much damage by uncritically taking hyperbole as measurements, resulting in dogma that is not reflected in the Bible (such as, effectively, “anyone who doesn’t utter this prayer will spend eternity in Hell…”). But God is good, and made a good creation. When he made humanity he was very pleased with the result. God spoke to Cain, saying, “if you do not do what is right, sin is crouching at your door; it desires to have you, but you must rule over it.” (Gen 4:7). Jesus made it brutally clear that in the final assessment, many who assumed they were “in” will be out, and many will be “in”, but a little surprised about that (Matt 25:31-46). This judgement was specifically said not to rest on professions of faith, but on acts of justice, and charity *instead*. Thanks for the clarifications Kevin. I’ve greatly enjoyed this little discussion. I definitely agree that there are two faces to Christianity as presented in the Bible. The kind of Christianity I was most familiar with was the one in which salvation came only through an actual specific knowledge of Jesus and the acceptance of various “facts” as incorporated into various creeds, and I guess this is mainly taken from the teachings of Paul. But it really does ignore things like the Sheep and the Goats passage, where Jesus himself (surely more of an authority on Christianity than Paul – although I have a friend who prefers the term Paulianity) explicitly says that it is the works that count. 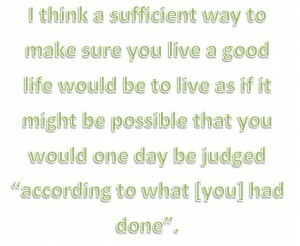 I think a sufficient way to make sure you live a good life would be to live as if it might be possible that you would one day be judged “according to what [you] had done”. In all frankness, if everybody lived “as if it might be possible that you would one day be judged ‘according to what [you] had done’, I am quite certain that God would deem this a successful outcome from Jesus’ mission. 1. Particularly the “works” vs “faith” question is a dilemma arising from the Reformation. It is an anachronistic misunderstanding of Paul. I recommend Tom Wright for clarification on that one. 2. Where other apparent differences might be seen, they arise from either a) Jesus had an itinerant ministry, whereas Paul was pastoring faith communities, or b) various anachronistic misreadings of Paul and/or Jesus (again, ref Tom Wright). 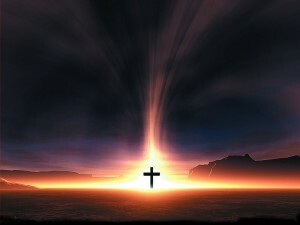 With the appropriate interpretive key, there is absolutely no daylight between what Paul taught and what Jesus taught. Interestingly, with that very interpretive key, there are telling gaps between what Jesus and Paul taught, and what modern Christian churches teach. I’m not convinced that the two faces are actually “presented in the Bible”. I think we look at the one face in the Bible and see only what we are taught to see. would you be willing to expand on your first paragraph, kevin? what do you see jesus’ mission as being? … and other things, I suppose. So he saw his mission as rescuing Israel from her sinful rebellion against God (=unbelief, injustice, immorality), dying for their sin in the role of “faithful servant” (sinlessly, sacrificially giving himself, etc), and rising from the dead as the spiritual progenitor of a redeemed Israel. The Jews would then be able to enjoy the benefits of the eschatological prophecies in Isaiah (and other prophets), as they were welcomed into this new, fresh “Israel”. Part of that eschatological picture is that the Gentiles are invited to the kingdom of God as well, to enjoy the benefits of God’s providence and wisdom. What this mission does is to redeem a people for God (firstly from among the Jews, but then also the Gentiles – Rom 1:16), who’s role it is in the world to exemplify and manifest God’s characteristics “as a city on a hill”. Evangelicals would have us believe that the purpose is to have everybody “in” that city, but I’m not convinced. The purpose of the people of God is to teach God’s wisdom, proclaim God’s benevolence, and “become the righteousness of God” (2 cor 5:21), which means to enact God’s blessings of justice, peace, love, etc. on his behalf. hmmm…. interesting. i’m guessing you would not consider yourself an “evangelical”? do you think jesus was/is god (and not just “of god”)? and about the last paragraph, what would you say it means to be “in that city”? and how about to not be in it? do you think there is a “life after death”? if so, will it be a spiritual existence? or an earthly resurrection of the physical body? There are many points at which someone who relished the term “Evangelical” would disagree with me. That’s the only measure of who is, and who isn’t “Evangelical”. The Biblical picture of whom Jesus is, as the “faithful” one, is kind of like taking the human Jesus and holding him up in front of God. Whereas with other people the outlines don’t really match in a lot of places, Jesus’ outline is indistinguishable from God’s. By this description, it sounds like I’m saying “no, Jesus is not God”, but it raises the question: what kind of man has the same outline as God? Surely only one who is truly God…? In fact, the dichotomy is a little misleading anyway. Mankind was created in God’s image, so the ultimate man should be precisely as God is. Jesus is presented as the ultimate man, who can only really therefore be the son of God, and divine, and therefore also God, and so it goes in the circle. The point of the Jesus thing is that in him, mankind and the divine meet. This is the hope/celebration: that the transcendent God has made it possible for us to become a part of him, and him a part of us. Life after Death: I think there is a life eternal. I’m living it. I will die, yet live. In my subjective experience I don’t anticipate any sense of time passing between my death and the subsequent experience. Resurrection is a key idea, fundamentally rooted in the Hebrew understanding of life. A purely “spiritual existence” does not conform to the understanding of “soul”, which is a body, quickened by spirit. This is “a living soul”. Although I have a ready anticipation of physical, emotional and spiritual ongoing life beyond death, I don’t conceive of what it will precisely be like. It really doesn’t concern me though, because I know that it’s good. I do find extraordinary comfort in the Revelation picture of heaven, “Behold, the tabernacle of God is with men, and he will dwell with them, and they shall be his people, and God himself shall be with them, and be their God.” (Rev 21:3). I might add that it was about 6 months after being somewhat dramatically converted to faith, during which I was having a bi-directional prayer life, reading a Bible for the first time, and generally getting recreated from the inside-out, before it dawned on me that this revelation had consequences for life-after-death. Even then, I was satisfied that this God, with whom I now commune and in whom my life consists, will look after the details, so I have nothing to worry about. There certainly is a diversity of beliefs, and it’s not clear to what extent that diversity reflects the way people process, store and communicate ideas which may otherwise be identical. The fact that Jesus communicated in parables is relevant to this. You can express much richer and more nuanced ideas in the form of a story than you ever can in systematic theology! The church is paradox in many ways. That is just one of them. When Hashem formed a man from the dust as “flesh”, he breathed into it ruach (“spirit”). As a result, he “became a living soul” (Gen 2:7). In this sense our body is like a circuit-board, and spirit like electricity – the combination is a mobile phone, but without both dimensions (physical and electrical) the mobile phone is not viable, and in a sense, not really a mobile phone at all. So we are also – flesh brought alive by spirit, the combination being called our “soul”, or “existence/life-in-the-created-order”. If the flesh and spirit are separated, our existence is over. Hence the hope of the school of the Pharisee in the 1st Century, insisting that the Resurrection is the ultimate hope of humanity – the reconnection of the spirit with the body. I trust that this very brief conversation has provided food-for-thought in Christian circles. It is my sincere hope, and indeed my frequent prayer, that we Christians will begin to better serve those whom we have effectively ejected, because we have been unwilling or unable to have open, frank, intellectually robust conversations about the faith. The corollary, of course, is that there are intelligent, thinking people in the pews today, getting frustrated with empty dogma, but feeling the cultural pressure against being seen to “doubt”. People have questions. Please, God, let them find faithful answerers. I’ve always thought the prospect of eternal life was a horrible one regardless of whether it was in pleasure or in pain. The idea that we are all forced to exist consciously forever and ever and ever and ever, to me is hell. What could one possibly do with eternity on their hands other than to ultimately descent into madness? I like the idea that my consciousness will one day be extinguished and that I will cease to exist both physically and mentally. So for me, one of the most used “hooks” to get people into religion, is actually the one that I despise. Where is there room for the person who doesn’t want to have to deal with the burden of consciousness itself? Can I wish to die if I go to heaven? Will the god of the Bible grant me that privilege if that is all I want? We are all entitled to our ideas about what we would like. But we weren’t given the option about existing in the beginning. We are brought into this existence on terms that we don’t control. The terms of our death are equally non-negotiable in that sense. The God of the Bible doesn’t advertise himself as fulfilling wishes like a bottled genie. The Bible describes life beyond death on God’s terms, which includes the formation of a community of individuals with perfect unity of spirit and purpose, which also includes perfect communion with God. It can be inferred from the Bible that those who desire no part in that communion will be granted exclusion from it. Therefore to the extent that we are granted any control over life and death, the God of the Bible is accommodating: None are forced to exist in eternal communion with God. Even further, God is offering a transformation such that consciousness is no longer a ‘burden’. Consciousness is designed to be joyful. If that is not one’s experience, the God of the Bible is offering to address that as the primary problem, and offers life ‘in abundance’ rather than burden. How long can “abundance” be joyful? How long can “bliss” possibly last when you are given a time frame of eternity? Eventually, it seems all possible conscious experiences, however abundant or joyful they are, will eventually tire, and the one thing completely unattainable – death, will begin appealing more and more. If you are given everything, but forbidden one thing, that one thing you will eventually begin to desire because we all desire what we cannot have. And in heaven, death is the one thing no one can have. 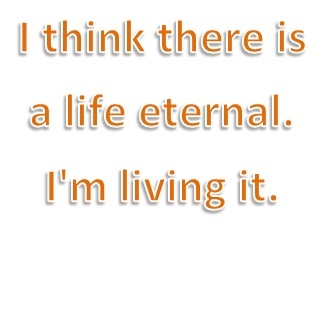 I don’t think Christians really know what they’re talking about when they say “eternal life”. I don’t think many Christians have seriously thought about how problematic eternal consciousness will be and what implications can be drawn from that. Can you serious live in joy and ecstasy eternally? Wouldn’t you grow tired of constant joy? Let’s just be honest and say that the Christian idea of heaven is silly, childish, not grounded in logic, irrational, and would eventually turn into hell for everyone given enough time. The only possible alternative that I can think of, is a heaven in which the conscious minds are turned into some kind of mental drones that are brainwashed and whose personalities are erased so that they just live in joy forever in a quasi mental state, and where they no longer ask deep philosophical questions. But what would be the point of that? In my opinion, Christians have really failed over the years to rationally explain the nature of heaven and eternal consciousness. The phenomenon of desiring the one “forbidden thing” is certainly present at the beginning of the Biblical narrative in the Garden of Eden, but it is not present at the end. The Biblical narrative is the story of how God takes a being (the human), which is subject to such whimsy, and recreates them into a new being which is not. In the beginning, mankind is shown to have choice. The simple fact of that “choice” phenomenon makes the “one forbidden thing” eventually irresistible. We are not told how long it took for them to taste it, and as you rightly point out, it doesn’t matter. It could be minutes, years, decades, or more. Philosophers agree, however, that “choice” is vitally important for a proper understanding of the human condition. In the “natural” human state, I agree. Mankind is not fit for heaven, and what you describe is, philosophically speaking, a valid prediction. “Death”, as the “one forbidden thing” would indeed become irresistible. In fact, “death” is precisely what Adam and Eve are said to have chosen because God told them that tasting the fruit would mean certain death. The Garden narrative can be understood precisely in the terms you describe. But the life of faith is one in which the individual is released from the paradigm of inevitable sin which leads to death. It is obtained, once again, by making a choice. It is a choice of a new, eternal life instead of a natural, deferred-death existence. The person, having made this choice, is actually changed in real ways (ref “conversion”, “new man”, “born again”, etc). “Choice” is no longer axiomatic in the new condition because we are no longer talking about the human condition as we know it. This is a new type of human condition – a “resurrection”/”converted” condition. A converted person does not require “the forbidden” any more because we are talking about a different paradigm of existence. The converted person would have no reason to require the choice of terminating their life in God, any more than we need to carry suicide pills around with us in this existence. Having tasted this new life, one finds the prior state simply intolerable. For those not having tasted it, it must seem fanciful and impossible to comprehend. Jesus said as much in this: “Very truly I tell you, no one can see the kingdom of God unless they are born again.” (John 3:3). Christians may well have failed to explain the nature of heaven. Indeed, Jesus resorted to a spectacular array of allegories in what appears to have been a frustrating attempt to express it to his hearers throughout his ministry (frequently: “to what should I compare the kingdom of God? It is like …”). The Bible makes it clear in many places, however, that entering into this faith experience is really the only way to begin to grasp it. I cannot presume to be more capable than The Boss in the attempt to “explain the nature of heaven and eternal consciousness” to you. I can discuss it, inevitably inadequately, but at the end of the day I can do no more than commend it. I see. So there is a tremendous amount of faith and conjecture involved with the hereafter, even as we are told to devote the life we have here to getting there. Of course I didn’t expect you to have all the answers about heaven, no one does. All we can use is our logic and our imagination as to what the concept of heaven really means. When I do this, I run into the problems I described above which leads me to think there are more problems with the concept of heaven than most Christians are willing or able to speak about. It is skipped over by so many of faith and talked about so vaguely that the atheist wonders if it has any basis in reality. I myself have concluded that heaven has no basis in reality. It is merely a product of wishful thinking and man’s overactive imagination. As such, I still have plenty of motivation to do good to others, because I know it benefits us all as a society. Well that’s fantastic. It’s important that we function well as a society. That is God’s overarching concern throughout Scripture. I would point out, however, that “getting to heaven” is an anachronism that modern Christianity has overlaid on a faith which originally did not think in those terms. Jesus taught that the kingdom of God is present (in his ministry), and that the Holy Spirit would ensure that this was a continuing fact into the future. What is too often skipped over is that “heaven” is not exclusively an afterlife concept. It is a state of being which is available here and now. It is freedom from sin (in the terms I used above), which is “rest for your soul”, in Jesus’ words. It is “reconciliation with God”, and it is superlative “peace”, which is the multi-faceted concept of “shalom”. So you might see that the faith is not actually about “getting to” heaven, but experiencing it. That experience includes a palpable sense of being connected to the eternal existence of God, and so the afterlife becomes part of the contemplation too. It is not, however, the primary concern of Jesus, nor the apostles. The primary reason Jesus discussed the afterlife was to assure his hearers that there would be a final judgement, in which the faithful would be vindicated. This is an essential assurance for a persecuted people. That assurance is broadly misunderstood and therefore misrepresented in the modern West, where persecution is completely absent from the lives of almost all of the Christian thinkers.